PICHON/BELLE-ANSE, Haiti – Delicate and petite, Nélia is 25 but looks like a teenager. She has already been pregnant three times, and has endured more than her share of tragedy. She lives in Pichon, a remote community in Belle-Anse, where the nearest health centre is a three-hour walk away. Like most women in Haiti, Nélia gave birth at home. The first time, she went into labour prematurely. Her grandmother delivered the baby, who did not survive. The second time, Nélia gave birth to twins, also at home. They died some time later. The third time, she was lucky. The pastor of her church assisted her. He is not formally trained but has delivered babies for community members. Nélia gave birth to a baby girl, who is now one month old. 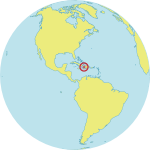 Haiti’s maternal mortality and child mortality rates are the highest in the Western hemisphere. Only 36 per cent of births take place in a health facility, according to a 2012 survey. Haiti also has a high rate of teen pregnancy, which intensifies risks for both girls and their children: Some 14 per cent of Haitian adolescent girls, aged 15 to 19, are already pregnant or have children. Globally, complications of pregnancy are the leading killer of girls in this age range. UNFPA is working to improve the availability of sexual and reproductive health care, and it is helping adolescent girls delay pregnancy by increasing access to family planning services. A recent mobile clinic – organized by the Ministry of Public Health and Population, with support from UNFPA – brought antenatal care, family planning services and other essential care to areas without health facilities. Yveka, 17, came to the clinic for an antenatal check-up. She is seven months pregnant, and says she has had headaches and pain. She received medication and counselling on nutrition, as well as information on how to prevent future unintended pregnancies. "I stopped going to school because of this unplanned pregnancy, but I hope to return after my childbirth while using family planning," Yveka told UNFPA. Christelle, 16, also visited the clinic for antenatal care. She is six months pregnant, and had her first child at just 14. The mobile clinic, held from 2 to 4 August, provided free medical care to about 400 people in Belle-Anse and Macari. Some 60 women and girls chose to start using family planning. In Haiti, 35 per cent of married women want to avoid or delay childbearing but do not use family planning. UNFPA is the largest provider of family planning commodities in Haiti, and is a major provider of maternal health medications and supplies. 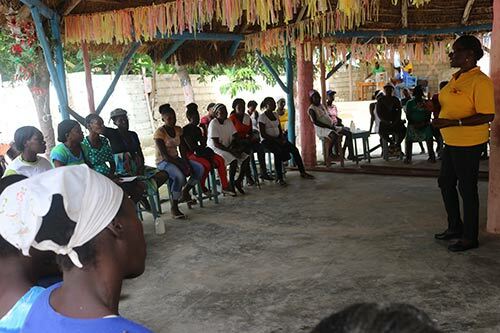 At the mobile clinic, Jacqueline Etienne, a UNFPA-trained health worker, counselled women and girls about the range of contraceptive options available. After speaking to Ms. Etienne, Nélia decided to use a contraceptive implant, which offers five years of protection from unintended pregnancy. "I would not like to have another child, because I do not have the resources to deal with it," Nélia told UNFPA. She is unemployed and has not heard from her daughter’s father since July of last year. Viergemène, 20, has two children. The first was unplanned. Like Nélia, she visited the mobile clinic to start using family planning. Rosena, 44, also told UNFPA she wants to use family planning. She will have to wait until she gives birth, though. She is seven months pregnant with her eighth child.